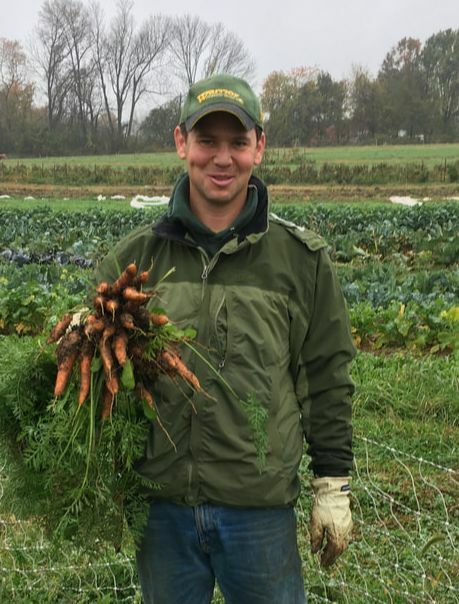 ​We are The Farm at Our House, a 12 acre, organically-certified vegetable farm in Brookeville, MD founded in 2007 by Marc Grossman (pictured below) and John Brill. Our farm, an LLC, is located on land owned by Our House, a residential job-training center for at-risk teenage boys. Our farming success is due in great part to the creative vision of the founder of Our House, Richard Bienvenue and long time board member, Dr. Ed Gould. In 2007 we started on a third of an acre with a walk behind rototiller, a bunch of hand tools and lot of heart. Since then we dug a well, put up thousands of feet of deer fencing, constructed 3 high tunnels and erected wash and cooling stations. We now grow on 6 acres and manage 12. It would not be possible without the incredibly talented and devoted people who have joined us on this sustainable agriculture journey. We love growing vegetables and take pride in providing reasonably priced organic produce for the people of Montgomery County, Maryland. We also offer the young men at Our House and area high school students the opportunity to explore the natural wonder that is sustainable agriculture. You can join us on our journey towards a sustainable future by being a member of our CSA, purchasing produce from our market stand at the Silver Spring, MD farmers market or patronizing the restaurants and grocers who source our produce. The farm is owned by Marc Grossman and his wife Katherine. Marc is also a social studies teacher at Montgomery Blair High School. The farm is managed by Anh Doan, a talented organic farmer originally from Vietnam. We are enormously proud of our relationship with our landlord, Our House Inc. and work to support their critical mission of giving young men second chances in every way possible. We also receive a hand from the countless volunteer hours students of Montgomery Blair high school have contributed and eaters like you. Read about farm owner Marc Grossman.